Hello all! Today I'm touching a topic on weaning your toddler for their first solid food. Some of the parent out there are eager to wean their babies off milk. 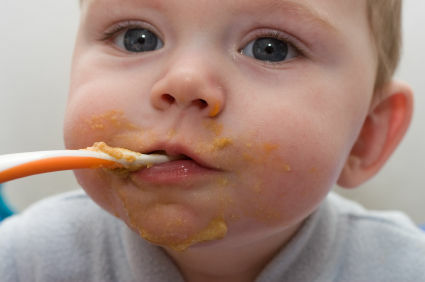 What does weaning mean? 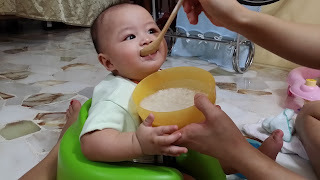 The weaning process begins the first time your baby takes food from a source other than your breast – whether it’s formula from a bottle or mashed banana from a spoon. Weaning is the gradual replacement of breastfeeding with other foods and ways of nurturing. Note that from a strictly medical point-of-view, the younger the baby the more important it is for him to receive breastmilk. For the premature baby, the benefits of breastmilk may be even more important than for the term baby. The more immature the baby, the greater the need for the protective features of breastmilk. It is recommended that for ideal nutrition, your baby should be exclusively breastfed for the first six months, and that nursing should continue after the introduction of solids for at least 12 months and longer if mother and baby wish. The World Health Organization recommends that babies be exclusively breastfed for the first 6 months, and that breastfeeding be continued for up to two years of age or beyond. To continue with my post, I started to wean my son when he was about 5 months old. Why did I wean him off so early? As I have a very bad engorgement, I develop high temperature and has to be on medication hence after the medication my supply drop quite a huge amount. I try purchasing those infant squash food from brands like Gerber. But it's kinda expensive and my boy didn't like it at all. I personally tried it to and I don't think I really like the taste. So I decided to try experimenting food for my son. Of course before I try anything, I will google if it's safe for consuming by toddler of young age. So now let me share some of the food which I personally tried and thinks it's good. Avocado is a good source of protein. Avocados get a lot of attention for their healthy fat content, and so a lot of people miss the fact that they’re high in protein too! Good for all of us to know, but especially those parents raising kids on a vegetarian diet. 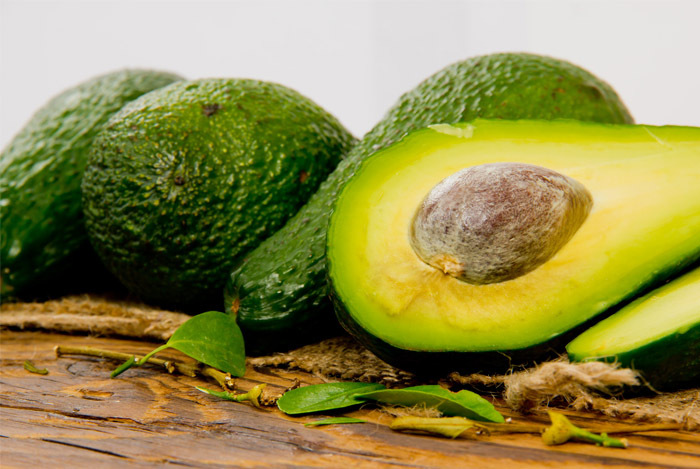 Rich in potassium (vitamin K) Avocados actually have more potassium than bananas, which is the fruit that traditionally comes to mind when we talk about vitamin K. It's full of fat. Who doesn't like chubby babies? Children should NOT be on a low-fat diet anyway; they are growing and need good fats for healthy brain and body development. Avocados are very high in these good fats! Because of its high fibre and fat content, even a small portion is quite filling. Try puree it in a food processor or blender until smooth. I specially bought a mini food blender off Q100 just to blend my son food. Add water if needed to reach desired consistency. I actually added with a little of breastmilk for some extra creaminess and taste instead of water. Don't worry if your milk supply has stopped totally. You can add formula milk too. 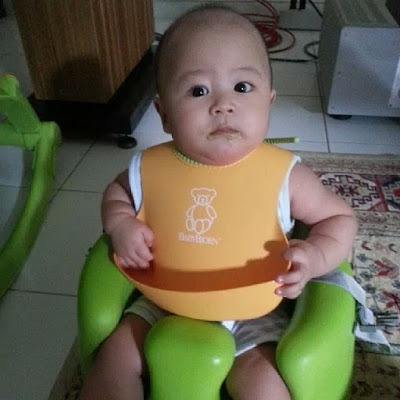 His stunt face after tasting the Avocado haha..
* Potatoes has a lot of good benefit and it's one of the simple vegetables that can be introduced in your baby's early diet. It's also easy to digest and it supplies energy for the baby to be active. 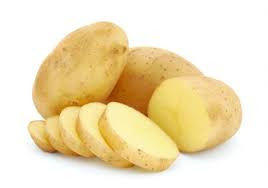 But due to high calorie content and low content of nutrients, it is better to introduce potatoes to your child between the ages of 7-10 months. To prepare, you will need to clean and peel the skins of the potato thoroughly. Steam it and mash it or put it in the food processor to mash it up. Same as avocados, you can add breastmilk or water if needed. Your little one will be filling after just a small amount being fed to him/her. This is an Asian recipe. If you are not sure what's porridge, let me explain more to you. 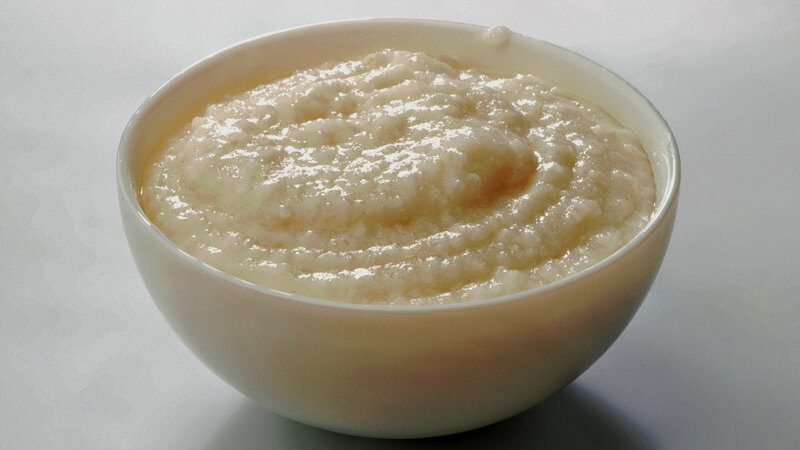 Porridge or also known as Congee is a type of rice porridge or gruel popular in many Asian countries. When eaten as plain rice congee, it is most often served with side dishes. When additional ingredients, such as meat, fish, and flavourings, are added while preparing the congee, it is most often served as a meal on its own. Despite its many variations, it is usually a thick porridge of rice largely disintegrated after prolonged cooking in water. It's easy on the stomach, soothing and extremely digestible, rice porridge is a wonderful food for children. What's even better about it is, it's so easy to cook and you can use almost any ingredients you want. You can keep it simple with just some common ingredients. Additionally, rice porridge recipes are great for busy moms. When you're too tired. For preparation, just wash 1 - 1/2 cup of grain rice. You can add chop carrots/potatoes and put everything into a slow cooker and let it cook. A couple of hours later, you'll have a your pot of porridge for the little one. You also don't have to worry about nutrition because it's all there. Carbs, proteins and fibre in one meal, plus no mess in your kitchen. What's more is that you can always prepare more and enjoy it with your little one. Note: Although used interchangeably, there's a slight difference between rice porridge and congee. Porridge is more watery, more grainy and not as smooth as the Cantonese congee. Sweet potato is a versatile vegetable which is one of the great first food for babies because of its soft, creamy texture, delicious taste and less allergenic nature. Sweet potatoes are high in Vitamin A & E, also loaded with more health benefits and hence including them in children’s diet is important for their growth & development. Sweet potatoes are less allergenic in nature and suggested as one of the best first food for babies. 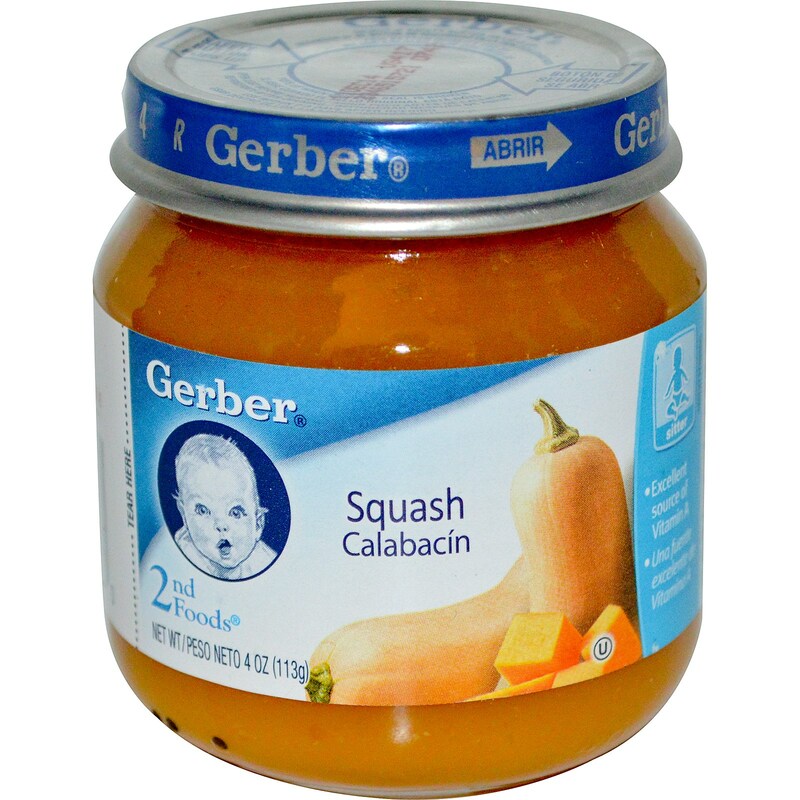 Hence you can introduce sweet potatoes to babies from 6 months and sweet potato puree/mash is good to begin with. 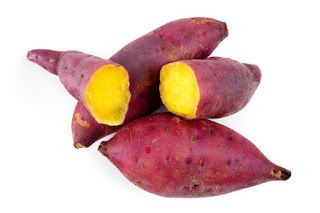 I usually use the Japanese sweet potato which actually is tastier and sweeter. Healthy Weight gaining food for babies and growing kids as its rich in natural sugars. Rich in Vitamin C and E that encourages healthy glowing skin. With every food, we have to take the good with the bad, and sweet potatoes don’t get a pass on this rule. 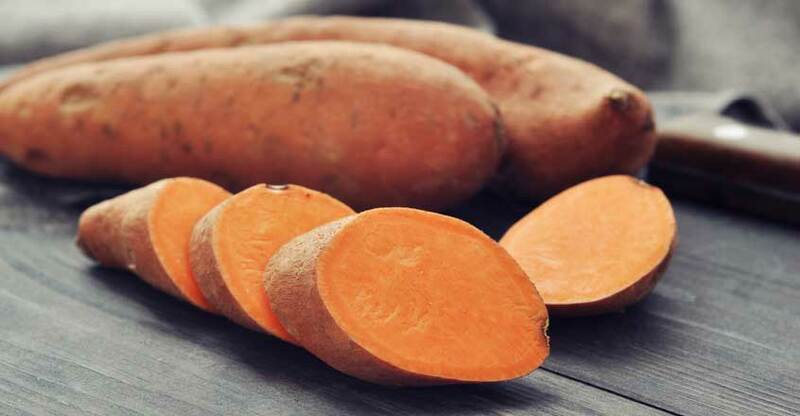 The “bad” here isn’t terribly damning, but it’s something to be aware of: sweet potatoes are moderately high in oxalates, a group of antinutrients that can prevent mineral absorption and may be linked to kidney stones or gallbladder problems. So do try mild quantity to your toddler and observe any sign of constipation before further feeding. You can steam the sweet potato and mash them. Add a little water. Note* Do not add milk for this. First let me tell you what's the difference between the 2. Pumpkin is one type of squash and Butternut squash generally refers to four species of genus cucurbita, including the species to which pumpkin belongs. 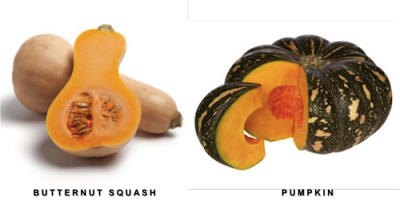 So, to make it clearer, both squash and pumpkin belong to the same family. Both are jam-packed full of some of the best nutritional compounds around. They are highly loaded with Vitamin A and beta carotene. Beta Carotene is one of the plant carotenoids that when eaten and digested, turns into Vitamin A in the human body. Beta Carotene may reduce the risk of cancer as well as heart disease. It also may be responsible for combating or putting off the degenerative effects of aging. Pumpkins are also good sources of potassium, protein, and iron. Butternut squash however, has more Vitamin A than pumpkin. Taste: Butternut squash is sweeter than pumpkin. Pumpkins have a more nutty, earthy flavour. The most simple way to prepare it for your babies is that you can basically just bake or steam either one and mash it. For more yummy recipe, you can just google. Do note though that pumpkin are high in Beta Carotene – Beta carotene is responsible for “Orange Babies”; if your baby’s nose, cheeks or even the soles of his feet are taking on an orange tinge, avoid giving your baby too much. To end off my post, I shall add in a bonus! There's this one fruits that I always gave to my son! It's sweet and healthy. It's the Dragon fruits! I know this is not a common fruits that anyone will feed their child, but I would like to touch on the healthy benefits. 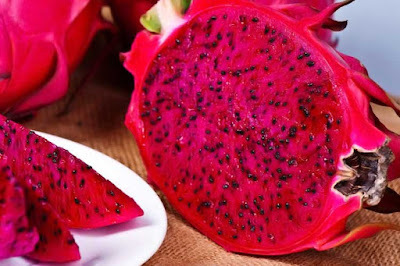 Dragon fruits have a surprising number of phytonutrients. Rich in antioxidants, they contain vitamin C (equivalent to 10 percent of the daily value), polyunsaturated (good) fatty acids, and several B vitamins for carbohydrate metabolism, as well as carotene and protein. Calcium is present for strong bones and teeth, iron and phosphorus for healthy blood and tissue formation. The benefits are realised in a number of ways, from a strengthened immune system and faster healing of bruises and wounds to fewer respiratory problems. I usually feed the red flesh dragon fruits to my boy as the health benefits are largely different to the white one and are usually sweeter.